The 101-acre Tanners Brook Preserve was purchased by Chester Township and Washington Township in December 2008. The property is located adjacent to Black River Wildlife Management Area.. The southern portion of the property contains an old “hunting cabin” along Tanners Brook Road as well as the ruins of an old farmhouse. A maintained power line right-of-way traverses the property to the east of the cabin. It runs from the Tanners Brook Road into the property in a northwest/southeast direction and make a turn more westerly/easterly in the center of the property. To the west of the cabin is a stone pillar, evidence that a structure once stood there. There is a stand of planted conifers to the southwest of the cabin. Much of the land along Tanners Brook Road consists of young forested wetlands. Northwest of the cabin is a cleared open upland meadow area full of tall grasses, wineberry, and wildflowers, including butterfly weed, goldenrod, and bee balm. This area was the remnant of one of the several distinct agricultural fields visible on historic aerial photographs. A well-constructed woods road, possibly constructed for development, begins a short distance to the north of the hunters cabin and continues to the power line to the northern section of the property. This road forms a portion of Patriots Path. The northern section of the property can be accessed along Old Four Bridges Road by an unpaved pull-out from the road. 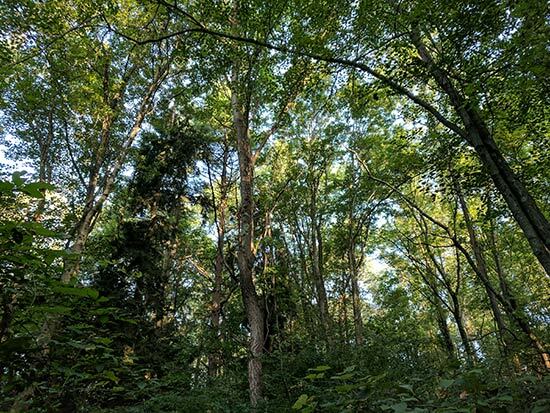 While much of the southern portion of Tanners Brook Preserve was farmland in the past and consists of relatively young, even-aged forest, there are areas of older forest on the northern portion of the property that likely were not farmed because they occur in a wetland. However, it is highly likely these older wetland forests served as woodlots and were logged for firewood and building material. The forest species composition includes large, mature American beech, sugar maple, oaks, and a particularly large Black gum. The forest floor was dominated by spicebush and ferns. Given the large size and late successional species composition of the trees, and the presence of large woody debris, this area is beginning to show old growth structural characteristics.